Blue Rose Epics | Entertainment: Magnolia (1999) Turns 18 Years Old Today! Magnolia (1999) Turns 18 Years Old Today! Eighteen years ago today, December 08, 1999, director Paul Thomas Anderson's third feature film was released in theaters to an unprepared and completely unsuspecting public. It is fair to say that most audiences were unprepared for this modern-day, emotionally raw film opera. It is a completely unique film experience unlike anything else made before or since that fateful month at near the close of the twentieth century. The emotional state of the characters were like Anderson's instruments, their stressful lives orchestrated out of the lives, cares, and troubles of a panorama of stressed denizens of the greater San Fernando Valley area of Los Angeles. These characters' emotional highs and lows move like a wave of music in this unique film symphony, ultimately transforming these disparate threads into a grand mosaic revealing a spectacularly humane portrait of parent-child relationships. The marketing, promos, and trailers for Magnolia (1999) were surprisingly vague, in part because the film is not really so much plot driven as it is character driven. And the film really emphasizes the emotional roller coaster that is humanity rather than focus on a traditional story structure. It truly is a unique work of art that I suspect will stand the test of time better and better over the next decades. Truth will out. It is fair to say critics were polarized at the time of Magnolia's release, as demonstrated by this informative video clip above showing Roger Ebert arguing over the film with a fellow critic and colleague. One group declared the film an overly long, confusing mess that doesn't add up much to anything special. The other group of critics, on the other hand though, go so far as declaring Magnolia a modern-day miracle, a true visionary achievement that should be celebrated as clearly the best film released that year in 1999. And this decades long argument is still active, a consensus still far from being reached. But as time goes by, Magnolia continues to gain more and more fans who catch up to Anderson's forward-thinking vision, who love and embrace this unconventional film in all its spectacular glory. Its characters are among the most fascinating, loveable, and hateable that you will ever find on screen. Filmmaker Paul Thomas Anderson, lovingly nicknamed P.T.A. by cineastes, has been considered a genius wunderkind by Hollywood since his powerful, critically acclaimed darling Boogie Nights (1997). A decade later his oil epic There Will Be Blood (2007) confirmed him as our generation's next potential Stanley Kubrick. Even the popular writer-director auteur Quentin Tarantino in recent years has admitted to a friendly rivalry between him and P.T. Anderson. The two filmmakers have long been compared to one another as they both attempt to outdo one another with each new movie they direct. Tarantino is on record comparing his professional rivalry with Anderson to that of Marlon Brando and Montgomery Clift, claiming the existence of each helped push each other to further heights of achievement. I strangely come across a number of critics, youtubers, podcasters, and bloggers who seem to find an evil glee in mocking Tom Cruise. Whether it is an attack on his sexuality, his religious beliefs, his love life, his family life, or his acting abilities, criticism against the superstar has been constant and incessant. But I point people no further than to Cruise's powerhouse performance here as Frank T.J. Mackey as he confronts his father, played by the late, great Jason Robards, for proof that Tom Cruise is in fact an extraordinary screen actor. 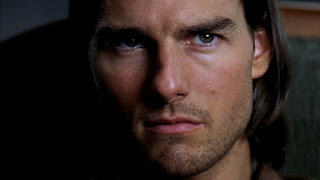 There is a reason for Tom Cruise's superstardom and box office appeal, whatever your thoughts are about his personal life and beliefs. I personally recommend we give him a break and appreciate him for the incredible talent he is. His celebrity, charisma, and starpower helped elevate Magnolia into another strata of "A-List" art than it could not have achieved without him. Shortly after finishing filming and promoting Magnolia, Paul Thomas Anderson commented in an interview, "I have a feeling, one of those gut feelings, that I'll make pretty good movies the rest of my life. … but I guess the way that I really feel is that Magnolia is, for better or worse, the best movie I'll ever make." 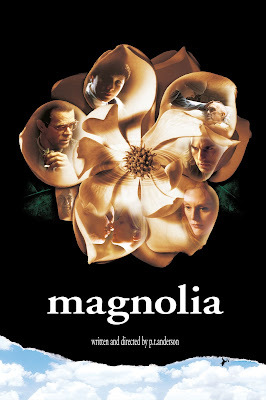 Now, eighteen years later, we have seen a number of other great films come from Paul Thomas Anderson, but I have to see anything else from him or anyone else that digs deep and will not let go of me like his masterpiece Magnolia (1999). It is truly the best film of his whole career so far, in my opinion. And in spite of me always looking forward to what he does next, I foresee Magnolia remaining in that top spot for many decades to come.